The Paintball Sport International featured a new product write up for Worr Game Product’s Sniper 2 in the April 1990 issue. Since magazines at the time had a typical three to four month period between article submission and printing, the date of April would likely mean the Sniper 2 was probably introduced in late 1989. 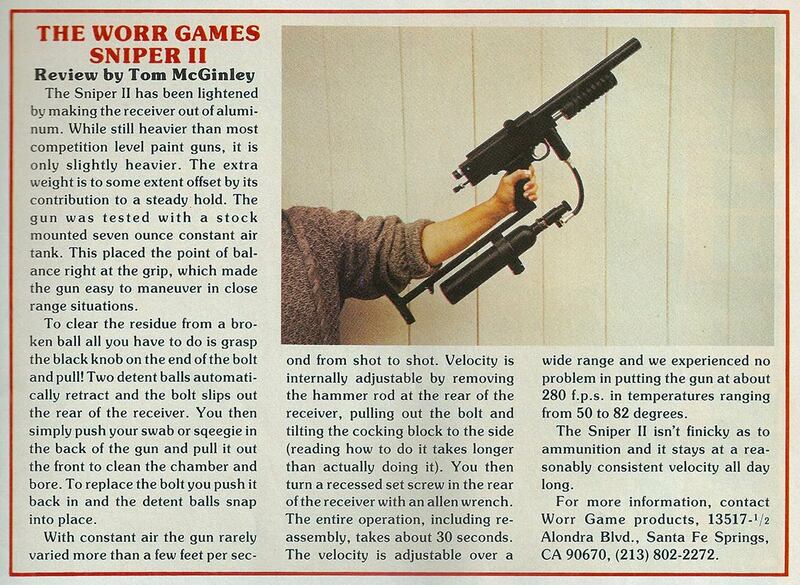 New product write up on the WGP Sniper 2, scanned from the April 1990 issue of Paintball Sports International. This was actually a little later than I had thought, but it still works out to a little over 6 months before the first wave of semi Automatics hit the market in July 1990 (not counting the Palmer’s Hurricane which premiered January 1990). Late 1989 is also over a year before the Ironmen first shot the Autococker in March 1991 at the Lone Star Open. 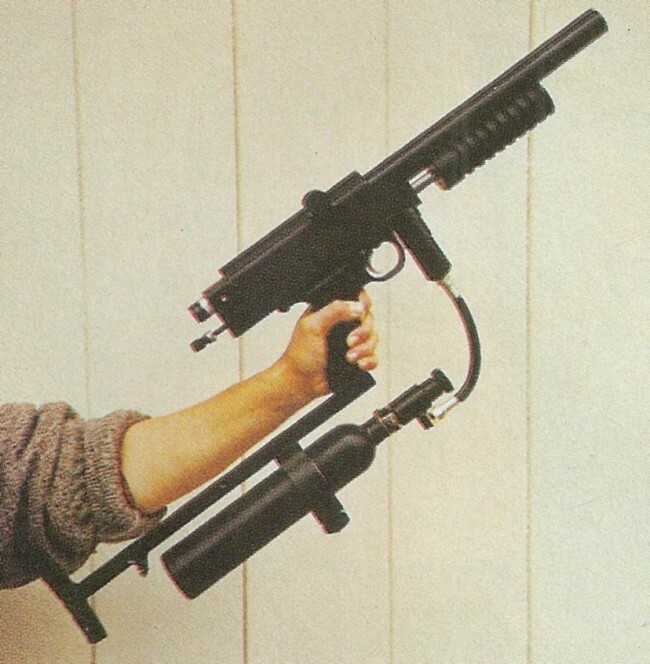 Crop photo of the WGP Sniper 2, as pictured in the April 1990 issue of Paintball Sport International. In PSI’s new product advertisement, the Sniper 2 features a WGP T stock with a tank ring, a female remote on off, the earliest style (non knurled) quick disconnect bolt, and a Sniper 1 style cocking rod (with a divot in the center). Standard knurled back Sniper 2 Quick Disconnect Bolt. •QD bolt (definitely an upgrade over the Sniper 1’s thumbscrew bolt). Worr Game Products T stock which was offered on Sniper 2s and Rangers. The added sight rail, which was worked into the extrusion of the body, and standardized bottomline holes weren’t mentioned but are definitely improvements over the Sniper 1’s features. The Sniper 1 used a screw on sight, which used small screws that could penetrade into the bolt area if not careful and the new frames with bottomline holes were definitely an upgrade over the sheridan stock frame and cast WGP Transitional Sniper 1/Commando frame. If you purchased your Sniper II new in 1989/1990 and still have the 25 year old receipt showing the date of purchase along with the serial of their Sniper 2 please email me photos so I can post them. I’m very curious on dates and corresponding serials. It could be that the new Sniper II extrusion bodies were finalized in summer of 1989 and the frames, qd bolts and other small pieces were added until later 1989. Sniper 2 bodies with Sniper 1 parts are occasionally called Sniper 1.5s but I think the body is really the determining factor making these 1.5s actually early Sniper 2s.